This is Part 1 of a two part series on the production of 2017 Garbage Pail Kids Adam-Geddon. Click here for Part 2. Topps closed out 2016 with a retail Garbage Pail Kids set that was produced in higher numbers than recent sets. The TV show theme didn’t always resonate either, as many complaints came in with collectors not understanding the gags. 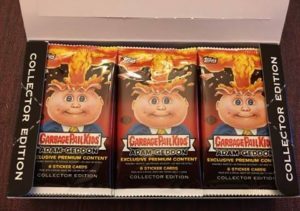 Throughout the last 10 months, Topps has also gone full steam ahead with various GPK online exclusives. Collectors did seem to be a little more excited when the theme of the first set of 2017 was released. Would the new Adam-Geddon theme with classic characters propel the new set to higher production? Or would over-production and collector apathy result in lower demand? I’m going to attempt to answer those questions in this two part series on the Adam-Geddon production. While Topps has kept a similar format as the previous releases, they still made some pretty major changes this time around. Some of those changes unfortunately makes it even harder to break down specific production numbers. Let’s see what we can actually figure out. First we need to figure out how many packs were made for the entire print run. In order to do that we need to use a card type where all the odds are exactly the same in Hobby, Collector, and Retail packs. Once again there is only one card type that fits that description in this set, the Fool’s Gold borders, at 1:51. Here is what we know, there are 180 cards in the set. Fool’s Gold cards are numbered on the back to /50. Therefore, 180 cards X 50 number of golds per card = 9,000 total Fool’s Gold cards X 51 odds = 459,000 total packs made for the release. This is our first stop along the way where things could go wrong. There is only one card type shared across all pack types with similar odds. 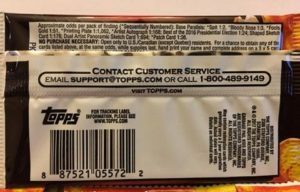 As you’ll see in a later discussion, while Autos and Plates are also shared across each pack type, Topps has drastically changed the odds on Jumbo Retail packs, therefore throwing off the numbers. We have to use what we have available to us. I believe this is a good starting point, and gets us on the path to more information. Now let’s try to figure out how many of each pack type was created for this release. Collector packs are always the easiest to figure out because they always contain cards that are exclusively made for the set. This time there is one type of insert and two parallels that are exclusive to Collector boxes, and are numbered on the back. The numbers are very close for two types, but off on the Bloody borders. Here’s why I think they are off. The actual odds for Bloody borders are probably lower than 1:3, but Topps rounds up on the packs. I’m willing to bet most collectors will average more than 8 Bloody borders per collector box, early box results show most boxes with 9 reds. I believe this gives us a good number of Collector packs. I’m going to go with 36,000 for our purposes throughout the rest of our discussion. Now let’s move onto Hobby packs. Darn you Topps! This was one of the major changes Topps made in the configuration of the product this year. Hobby packs are basically Retail packs now. There is nothing to distinguish a Hobby pack from a basic Retail pack. In previous releases we could use a card type that Hobby and Collector packs shared, that we also knew the print run of. Since that no longer exists, and we can’t tell the difference in packs, there is no way to determine how many Hobby packs were produced. While this is frustrating, it won’t stop our quest! For the rest of our discussion I will combine Hobby packs into Retail packs. We know we have 36,000 Collector packs. So how many Retail/Hobby packs do we have? 459,000 total packs – 36,000 Collector packs = 423,000 Retail/Hobby packs. While that’s a lot of packs, is significantly less than previous releases. 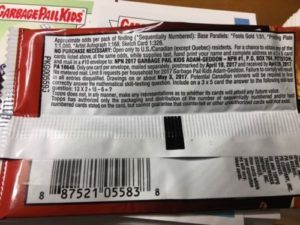 One way I use to be able to double check my numbers was to use another card type that is in all pack types, where we know the print run. There are two types that fit that description, Autos and Plates. Let’s looks at the numbers for both types. What a second….that’s a lot less total packs than what we came up with earlier. We can’t use these numbers because of another change Topps made on the odds. In previous releases the Jumbo Retail packs counted as 2 regular packs. All the odds on Jumbo packs would be exactly half of a regular pack. So it made it very easy to just count each Jumbo pack as 2 packs. With Adam-Geddon only Fool’s Gold and Sketch cards have the odds halved. The Plate and Auto odds are the same as other retail packs. That tells us plates and autos will be much harder to pull in Jumbo retail than regular retail packs. It also explains why the total pack numbers are lower when we use these numbers above. Its only counting the Jumbo packs as 1 pack, which makes sense based on the odds. That leaves us with 423,000 Retail/Hobby packs. We can however deduce from the number above there is right around 45,000 Jumbo packs produced. We aren’t however able to break down the pack distribution any further with this series. We don’t know the total print run of the various sketch types. Those are the only other different card type inserted into packs. So the best we can do is come up with a total retail pack number of 423,000. Topps prints to order their product. Which means based on distributor pre-orders, Topps decides how much product to produce. The numbers tell me this set was under ordered compared to previous releases. It shows collectors continue to purchase Collector cases in similar numbers. However, retail orders appear to be down significantly from previous sets. Topps made other changes as well that affects the print run. The base set is almost 20% smaller than previous sets. Topps also changed the number of cards in a pack, to 8 across the board. As you will see in part two all this changes how many of each card type exists. 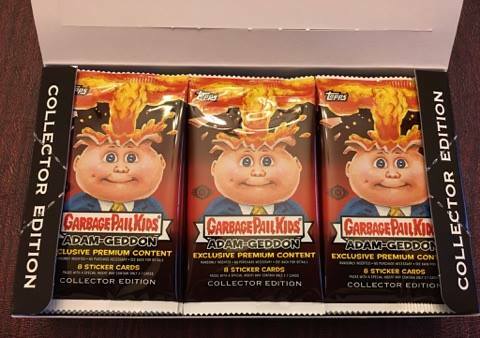 This is Part 1 of a two part series on the production of 2017 Garbage Pail Kids Adam-Geddon. In Part 2 we will look at production numbers for all parallel and insert sets. Part 2 can be found here.